I am always fascinated by how certain things trigger memories. Like a piece of music, a photograph, smell, atmosphere, piece of drama or something that you hear on the radio. The sight of Spring flowers and birds singing in the hedgerows triggers memories for me of childhood days and walks in the countryside with my parents, along with other memories of shedding the winter coat and walking up Castle Terrace in Berwick upon Tweed as a young married couple up to Bible college. Pleasant, happy memories. This week’s trigger point brought back very contrasting memories. It’s thirty years since the miners strike, a historic event that marked the decline and virtual closure of the coal pits throughout Britain. Leaving whole communities devastated; many of whom that have never recovered and who bear to this day the scars of policies that dismantled union power, workers rights and, with over half of Government investment going into London and the South East, signalled the decline not only of major industrial bases with ship yards, factories, engineering plants and steel works closing in the Midlands and the North of England but hundreds and thousands of people who lived there. 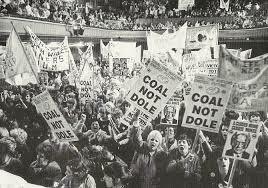 There is no doubt that those communities were not always well represented by their leaders but I remember the miners strike and that period that witnessed some savage economic and political measures which destroyed many of the North East communities that I knew. 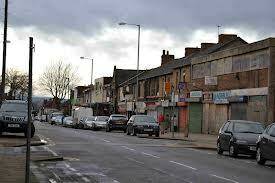 Where we were living on Teesside, we saw unemployment, a troubling and challenging 18%, rise within 4 years to over 50%. Skilled and semi-skilled workers, hard working people who didn’t earn a great deal but who lived sufficiently, supporting their families and with a great sense of neighbourhood and community, if losing their jobs, thousands of them. Knowing of families where mothers cried themselves to sleep because they were unable to feed their children that night. Men salvaging coal dust on the beaches, others spending their days scrounging or pinching wood and anything else that would burn to give some warmth and heat to their homes. For a sense of what communities were like and the impact of the strike upon them it’s worth watching ‘Brassed Off’ the great film that touched so many who saw it when it was released back in the 90’s. This week if I was teaching at Cranmer Hall, Durham and I was talking to students about leadership and we were discussing how vocation evolves and develops and how often events or experiences deepen a person’s consciousness and sense of calling. We looked at the Biblical example of Moses, who was moved by the plight of his people the Israelites, suffering at the hands of the Egyptians. I’m pretty sure that was a factor that God used in his calling Moses to be the liberator and leader that he became. If For me, witnessing the injustice, poverty and suffering of people in the North East in the 1980’s, certainly influenced my decision to engage more with politics and to see that the gospel had social, political and economic implications for society, how we live, work and treat our fellow human beings. Grim days that witnessed some atrocious behaviour from both sides of the dispute and the insidious and evil cover-up by the police authorities. 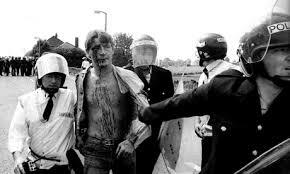 One wonders what other things will come to light as people continue to call for a public enquiry into the dispute or ‘Battle of Orgreave’ as it was called, the bloody and violent confrontation between police and picketing miners at the British Steel coking plant in South Yorkshire in 1984. 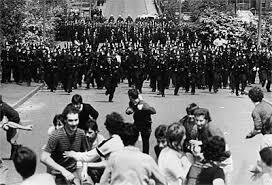 In 1991, South Yorkshire police were forced to pay out half a million pounds to 39 miners who were arrested at Orgreave. Michael Mansfield QC described the evidence given by the police as “the biggest frame up ever”. He said that the force had a culture of fabricating evidence, which was not corrected by the time of the Hillsborough disaster. Dark days, salutary times, that seem so distant in the memory until you drive through those once proud communities, now desolate or so run down and depressed that in their hopelessness the only prospect, for so many, particularly young people, of something positive, comes from drink and drugs that are now rife on neglected former mining communities.